New for 2018! We are creating a beautiful full-color event program guide. 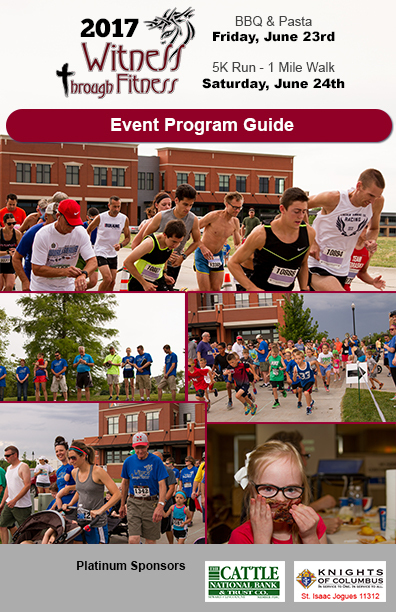 500 copies of the guide will be distributed at the BBQ event and inserted into the Walk and 5K Run Packets. Limited copies of this guide will also be distributed as a promotional tool in advance of the events. It’s a great way to put your business in front of fitness enthusiasts, students, parents, Catholics and others who come out to show their support for children of families with special needs. Let them know your business also supports such a worthy cause! All Event Sponsors are featured in the printed guide and on our web site. A Gold Event Sponsors includes a Quarter Page and a Platinum Event Sponsors include a half page ad. All other event sponsors may add display ads and receive a 20% discount on the rates below. All ads must be 300 dpi. Instructions for PDF artwork submission: NO CROP MARKS; no registration marks; turn ALL fonts into outlines; embed all images. Ad design available. Sponsor to provide logo, image(s), ad copy, and any desired fonts. Production includes an initial proof with one set of changes before ad is finalized. Additional design work is available at added cost. Limited Availability. Reserve Spot Today. Limited availability on a first come, first served basis. Reserve your spot today and we’ll invoice you later. Contact Brian Nelson at 402-937-8540 or brian@wtfsnf.com with any questions.